How to hard refresh your browser and clear your cache. You may have noticed that when you return to a website you’ve visited before, it loads a faster than it did when you first visited it. This is because you browser stores a copy of the website on your computer. The browser does this because it is a lot faster for your browser to load the website locally, opposed to downloading the website from the internet again. Why do I need to hard refresh my browser cache? Although storing pages to the browsers cache makes loading pages faster, it can mean that changes made to the website aren't always visible until you preform a hard refresh. A lot of our web design clients notice that when we make changes to their websites, they cannot see the changes when they visit the site. 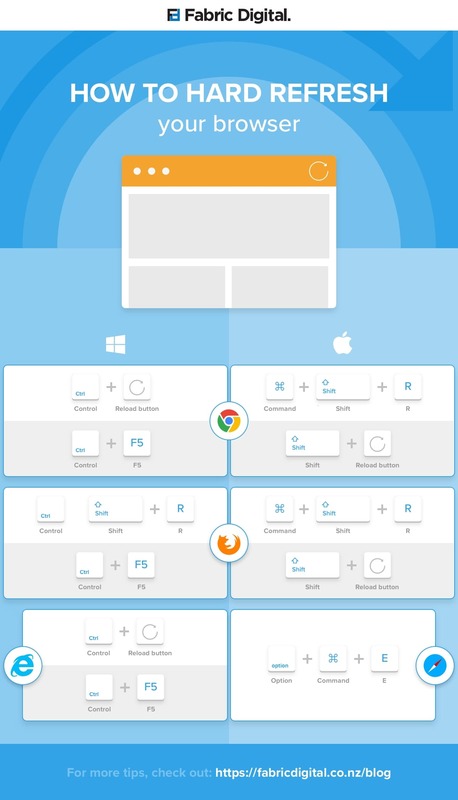 If you prefer to learn visually, we have created this Infographic for you to use. If you decide to share it, please reference Fabric with a link back to our website. How to hard refresh browser and clear cache if you're using Chrome. Or Hold down Ctrl and press F5. Hold down Shift and click the Reload button. Or Hold down Command, Shift and click the ‘R’ key. How to hard refresh browser and clear cache if you're using Firefox. Hold down Ctrl, Shift and the ‘R’ key. Hold down Command, Shift and the ‘R’ key. Or Hold down Shift and press the reload button. How to hard refresh browser and clear cache if you're using Safari. To hard refresh safari, there is one simple way to do it. Hold down the option and command key then press the ‘E’ key. Hold the Control key, press the F5 key. Or, hold the Control key, click the Refresh button. Thanks for reading and we hope this helps anyone who is looking to hard refresh their browser.